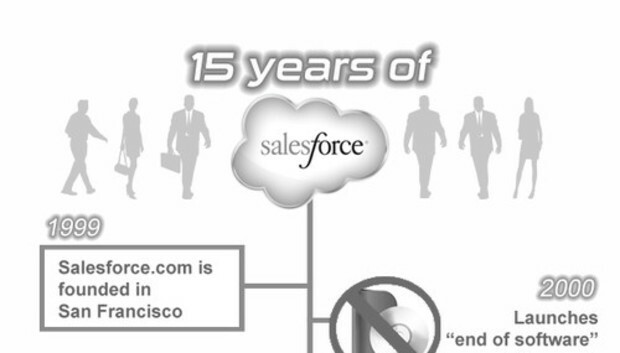 Fifteen years is a significant length of time, and Salesforce.com has certainly kept itself busy so far. Here's a look back at the company's long-term influence on the software industry, a snapshot of where it stands now, and a look into what its future may hold. Defining the cloud: "Salesforce.com really established the cloud as a viable platform for enterprise applications," said analyst Frank Scavo, managing partner of IT consulting firm Strativa. "I don't think there's any question about that." In doing so, Salesforce.com took cues from the consumer Internet, knowing it had a chance to avoid duplicating enterprise software's traditional heritage of clunky user interfaces. "When we started we just had a vision: Build this right the first time," said co-founder Parker Harris. The company took its initial design influences from the likes of Amazon.com, Facebook and Apple, he added. Force.com: The launch of Force.com in 2007 helped usher in the era of PaaS (platform as a service). Force.com gave customers a cloud-hosted option for extending Salesforce.com, and partners a way to create entirely new applications that could be closely integrated with the vendor's core products. By 2010, there were more than 300,000 Force.com developers and 185,000 custom applications had been written on it, according to Salesforce.com. AppExchange: In 2005, Salesforce.com unveiled its AppExchange marketplace, and today the portal holds more than 2,200 partner-built applications. Rivals such as SAP, Oracle and others have since moved to create similar marketplaces centered around their own technologies. While Salesforce.com's influence in this area is undeniable, so far it's hard to point to a natively built AppExchange application that's a "breakout" in terms of revenue generation, Scavo said. Social swagger: Salesforce.com embraced social networking early in the craze, integrating with Facebook in 2008 and Twitter in 2009, then launching its own social messaging and collaboration service, Chatter, in 2010. In 2011, CEO Marc Benioff led a major marketing push centered on "social enterprises," or how Salesforce.com customers could use the social media milieu to improve internal operations and reach their customers more effectively. This notion has since morphed into the concept of the "Internet of customers," a theme that leans on newer trends such as machine-to-machine communication. Customers first: Software companies have always worked with customers to determine which new features are desired and should be prioritized. Salesforce.com took cues from the social Web when it created Ideas, now known as the IdeaExchange, in 2007. Customers can post their ideas for new features on the site, and then vote up or down on others' suggestions. Salesforce.com product management teams monitor the site and keep customers updated on which ones have been chosen for inclusion in the software, and when they'll arrive. The IdeaExchange's transparency has perhaps inadvertently caused Salesforce.com to make significant business decisions. In 2012, it announced that a set of new analytics capabilities would be provided at no charge, after an outcry from users who had made IdeaExchange suggestions along the same lines. Happy customers: Both through acquisitions and organic growth, Salesforce.com continues to add customers at a heady pace. What's just as important, and telling, is the fact it is keeping the vast majority of those customers. Customer "churn," or turnover, was in the "high single digits" as of Jan. 31, down from a "low double-digit" range one year prior, according to Salesforce.com's latest annual report. Iraq and Afghanistan Veterans of America is one happy Salesforce.com user. The nonprofit organization began with a modest website in 2004 and now serves 200,000 members, said CEO Paul Rieckhoff. IAVA uses the system to record veterans' personal data and connect them with services and educational opportunities. "Salesforce has been really like jet fuel [for IAVA]," he said. "I don't think most of our growth would have been possible." IAVA has a "pretty vast and often daunting network of partners" across the country that Salesforce.com helps weave together, he added. "I don't think we can overstate how much energy and time it saves to have all your data in one place." Salesforce1: Despite Force.com's success, Salesforce.com's core architecture had begun to age in recent years, and the company had also brought in additional application development tooling with the 2010 acquisition of Heroku. November's Dreamforce conference set the stage for Salesforce.com to hit the reset button on its platform story with the announcement of Salesforce1. The name is meant to invoke a sense of unification between the vendor's development tools, which now also include ones from its acquisition of marketing software vendor ExactTarget. Salesforce1 also introduced a vastly larger set of APIs (application programming interfaces) and a new mobile application that runs not only Salesforce.com but partners' software. "It was time for Salesforce.com to come up with a new platform vision - and it did with Salesforce1 - with great ambition and a promising design," Constellation Research analyst Holger Mueller said in a blog post. However, gaps remain in Salesforce.com's platform, particularly regarding big data and analytics, he added. Marketing mojo: "In order to continue growing, Salesforce needs to grow outside of sales force automation," Scavo said. Salesforce.com has spent billions on acquisitions to do just that and set itself up against Oracle, SAP, IBM and Adobe in the red-hot marketing software market. Benioff has declared that marketing software will be Salesforce.com's next $1 billion business. What Benioff is not doing is predicting exactly when that will occur, and perhaps with good reason. "Substantially all" of Salesforce.com's revenue is derived from CRM (customer-relationship-management) software subscriptions, according to its annual report. "We very much see our growth as a mix of supporting our customer base, growing [their investments] and bringing in new customers," co-founder Harris said. The cloud is a commodity: Benioff often used to crow about the scalability, flexibility and other benefits provided by Salesforce.com's cloud infrastructure. But today, that talking point isn't of much strategic value given the plethora of SaaS options in the market. In one sense, Benioff has even had to backtrack. At Dreamforce, along with Hewlett-Packard CEO Meg Whitman, he announced Superpods, special dedicated instances for Salesforce.com's largest customers that use HP's Converged Infrastructure hardware and are hosted by Salesforce.com. While not amounting to a traditional on-premises deployment, to many ears the Superpod announcement sounded like a tacit recognition that the public cloud simply isn't desirable for some companies. On the bubble? : It's hardly news that some financial analysts and stock bloggers believe Salesforce.com's emphasis on growing top-line revenue while spending heavily on marketing, acquisitions and hiring, versus showing a profit, is a problem that flies in the face of its strong stock price. Salesforce.com is staying the strategic course for now. "We're a growth company and we put all of our money back into driving innovation," Harris said. "We're acquiring great companies. If we were slowing down and not as aggressive in our growth we wouldn't be able to deliver on our vision." Out of ideas? : Salesforce.com recently announced a push into industry-specific versions of its software, prompting InfoWorld blogger and cloud computing expert David Linthicum to declare the company was "officially out of ideas." "When you run out of new ways to provide innovative technology, you go vertical," he wrote in a recent blog post. "That was the running joke among CTOs back in the day. It usually meant the market had reached the saturation point and you could not find new growth, so you hoped that a health care strategy would save you. Sorry, no." "Salesforce will soon discover that when you get into vertical industries, the existing foundation of industry-specific applications is difficult to displace," he added. Competitive creep: Salesforce.com might boast an impressively low churn rate, but it's also facing increased pressure in the CRM market from the likes of Microsoft, particularly on cost. "Salesforce has become so well-established and so well-known it's not a cheap solution," Scavo said. "They are able to command a premium price." Insurance company XL Group is moving from Salesforce.com to Microsoft Dynamics CRM, after originally intending to roll out Salesforce.com globally, said Paul Kelly, director of IT strategy. The fact that Salesforce.com hadn't been completely implemented gave XL Group a chance to step back and assess its options. Microsft's Dynamics CRM started to make more sense for a number of reasons, Kelly said. "One simply is cost," he said. In addition, Dynamics CRM has "a more natural integration" with Microsoft's Office Suite, he added. As far as Salesforce.com's software itself, Kelly had little bad to say. "There's similar functionality with both platforms." Odds on ERP: Salesforce.com today offers so much beyond its original CRM software that it's arguably misnamed, in Scavo's view. Salesforce.com to date has made a series of partnerships with ERP (enterprise-resource-planning) vendors, including Infor, and has formed a joint venture with Unit4 Agresso called FinancialForce.com. It's also close with cloud-based HCM (human-capital-management) and financial software provider Workday, and a number of companies, such as Kenandy, have actually built ERP applications on its Force.com platform. With ERP giants Oracle and SAP moving now to offer cloud-based versions of their software, Benioff may decide that the vendor's next big business is not marketing or verticals, but ERP. Mega-merger? : One favorite topic of speculation when it comes to Salesforce.com is whether it will be acquired by or merge with a larger vendor. While Salesforce.com's current market capitalization means such a deal would be quite costly, there's no way to rule out this scenario. The more likely outcome will see Salesforce.com continue to make acquisitions of its own in order to ensure the company's steady growth rate. Big play in big data: Smart bettors will look for Salesforce.com to make some of its biggest investments in analytics companies, both for crunching large amounts of unstructured information from sensors, devices and the social Web, as well as visualization tools aimed at end users. Benioff's fixation on the "Internet of customers" will just be rhetoric unless Salesforce.com delivers the technical goods customers need to fulfill the dream.